Heather Gray Converse Sneakers first surfaced on Chictopia's streetstyle gallery in Spring 2012 seen on Siloam Springs blogger amandromeda of https://amandromeda.wordpress.com. She wore her heather gray Converse sneakers with a black polka dot dress and light purple bag. Since then, Heather Gray Converse Sneakers have grown in popularity as bloggers from Brooklyn, Pittsburgh, and Los Angeles have discovered them. Heather Gray Converse Sneakers are generally seen in casual, comfortable, and chic style. Popular types of Heather Gray Converse Sneakers are classic, leather high tops, used, high top, and chuck taylor. 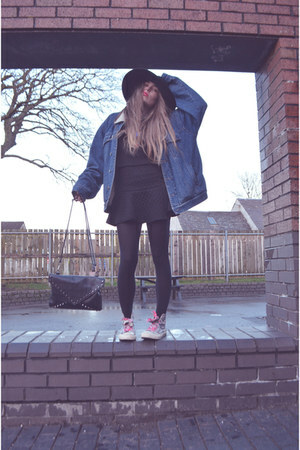 There are currently 95 streetstyle photos of bloggers wearing Heather Gray Converse Sneakers. Most recently, blogger HollyDolly of hollydollydarling.com wore her heather gray Converse sneakers with a yellow Sheinside coat, black Urban Outfitters jeans, and red H&M scarf.